The fun continues over on the Joli Paquet Blog! Kit sales began yesterday here and here. (Thanks to all of you, my kits have sold out!) 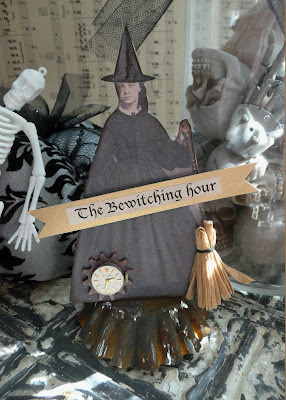 Now today is MY turn to post my Bewitching Tutorial for the little witch shown above. I love working with rusty old bits and bobs, but sometimes it's hard to find just the right old piece for a project. Well, there is a way to make new things look old, rusty and aged and you'll see how by clicking right here. Love love love her! Too cute! Totally cute and oh-so adorable. Thanks for the great tutorial! I borrowed your "witch" ...she is so awesome, to make a card.